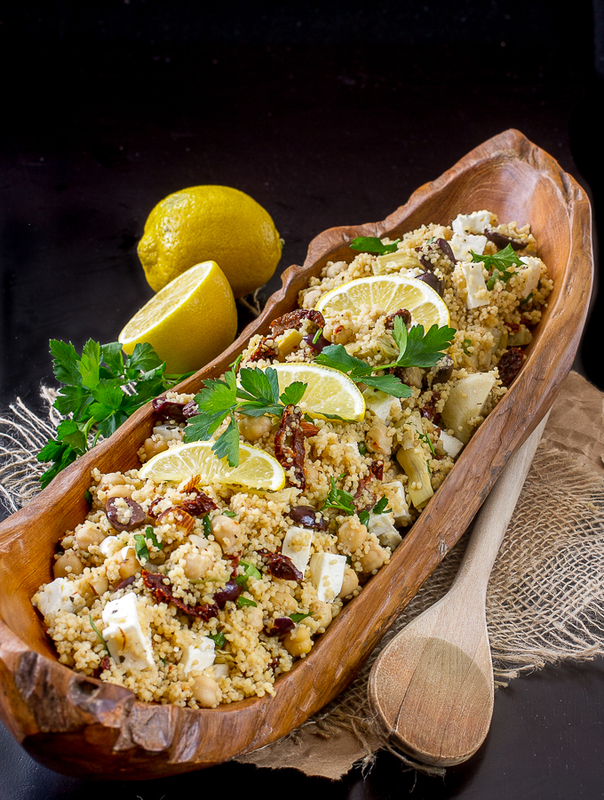 This Mediterranean Couscous is filled with artichoke hearts, sun dried tomatoes, feta and other goodies. It’s a snap to prepare and makes a fantastic side dish for dinner, or even a main dish lunch. And, it makes a great pot luck dish too! A few weeks ago while trying to eat up food in my pantry to prepare for our move to Florida, I quickly threw together a Mediterranean flavored inspired Couscous. Wow, was it delicious, so much so that I had to make it again to photograph and share here on the blog. It’s a perfect side dish with any grilled (or baked) fish or meats, and perfectly wonderful on it’s own as a vegetarian main dish. It earns bonus points its my book because it can be served at room temperature, which makes for a great dish to take along to a pot luck (think spring/summer picnics…we’ll be there soon!). I had one of those big jars of marinated artichoke hearts from Costco so I used about half of them in this dish along with some sun dried tomatoes, kalamata olives, feta cheese, garbanzo beans and chopped almonds. I was going to use pine nuts but couldn’t find any so almonds it was. However, I think any nut would be good… gives it a really nice (and needed) crunch factor. I didn’t use any dressing with the couscous, just some of the artichoke marinade and additional seasonings but if you want, you could easily add some vinaigrette or greek salad dressing if you’d like a “wetter” couscous. 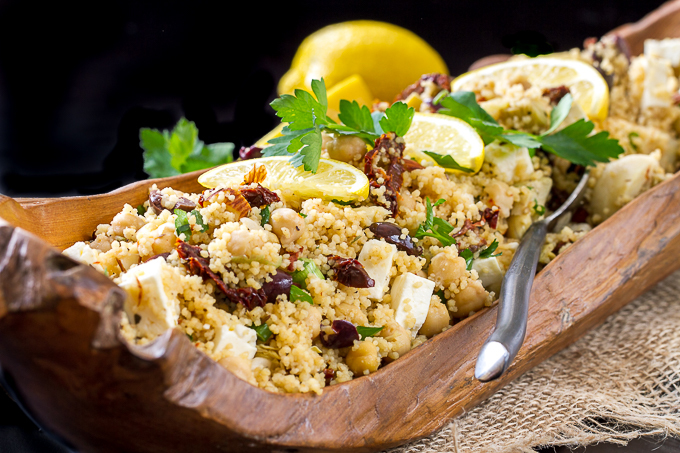 This Mediterranean Couscous is one of those flexible recipes so feel free to adjust the amounts of any of the ingredients to your liking. This is just a general guide of how I made it. You could even toss in some cooked chicken if you want. And, as always, taste and adjust seasonings, you might feel like you need to add a little salt & pepper or more greek seasoning. I added some of my favorite balsamic glaze (balsamic reduction) which was fantastic on this…well, who am I kidding, I love that stuff on everything! Add chicken broth, garlic and olive oil to small sauce pan. Bring to boil. Add couscous, turn off heat, cover and let sit as directed on package directions. Fluff couscous with fork, then add to large bowl. Add remaining ingredients to couscous and stir to combine. Taste and adjust seasonings or drizzle with balsamic glaze, as desired. *I used sun dried tomatoes not packed in a jar with oil so I added them to the chicken broth to plump up a bit. If you're using sun dried tomatoes packed in oil, just chop them up and add them with the artichoke hearts and other ingredients. No need to rinse artichoke hearts or sun dried tomatoes. I added about ¼ c. of the marinade from the artichokes as a dressing. If you want a "wetter" couscous, add more, or some greek salad dressing or vinaigrette. Stunning picture… Love that serving dish! You read my mind. I have some cooked chicken breasts and was just going to do a grilled chicken salad but now, this is it. I’m going to use quinoa. David will be with me at the store so he can pick and choose the ingredients, but artichoke hearts are a must. We actually have some pine nuts on hand (rare). Thanks Judy! What did you end up putting in it Anita??? The first night we used artichoke hearts (what a treat! ), bell pepper, cooked mushrooms, onion and garlic. I made a lot of quinoa so last we had it again, this time with chicken, artichoke hearts, the leftover mushrooms, pine nuts and feta. I don’t like pickled anything (hence no olives) so while I did eat the artichokes I didn’t use the juice. It was fine dry, but David did use the juice. Quinoa is so easy on the stomach. I don’t feel bloated and it takes on any ingredient you put on it. The only thing I usually add to it which I didn’t this time was fresh herbs, but it didn’t need it. I love that bowl too! It was holding my remote controls on the coffee table and I thought it would look great as a serving dish. I’m certainly enjoying Florida so far, although I’ve basically just been unpacking! I love the pictures, and I love the practice of making things up while I’m standing in my pantry. :o) We have to do that every couple years when the military moves us from place to place, and I always find a new favorite dish when I’m pressed for time and pantry space. This looks delicious! I’ll have to make this one soon! I love cous cous salads because of how versatile they are, and this one has great ingredients and combinations. With this salad and a soup or green salad, you’d have a delightful brunch or lunch.